Description: Tail is white when seen from below; seen from above, white outer tail feathers are conspicuous when tail is flicked open. 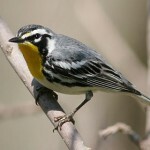 Male has extensive black hood; broad yellow eye mask; greenish-olive above; and yellow below. 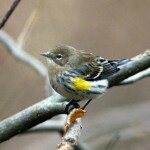 Female shows blackish or olive crown and sides of neck; sometimes has black throat or black spots on breast. Behavior: Generally stays hidden in dense undergrowth and low branches. Habitat: Migrants found in woodlands, city parks, and sometimes residential areas. 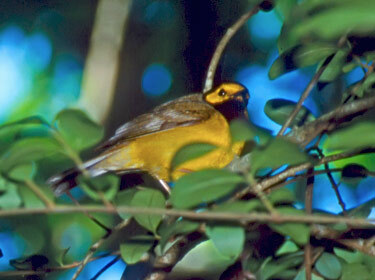 Breeding birds are associated with moist, mature forests having considerable undergrowth. 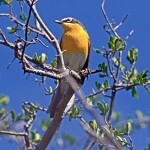 Where in Nebraska: Rare spring and fall migrant in eastern Nebraska. Reported as far west as Cherry and Dawes Counties. Most often seen in Douglas, Sarpy, Lancaster, and Adams Counties. Fun Facts: Hooded Warbler males and females use different habitats on their wintering grounds. Males in mature forests and females in scrubbier more seasonally flooded forests.